Elinor Margaret Mummaw, 92, passed away February 2, 2019 at Sagecrest Nursing Home. She was born August 19, 1926 in Lima, Ohio to Robert and Louise Skelly. Elinor was the eldest of eight children. Elinor was married to Robert Louis Mummaw on July 12, 1944. She loved reading and enjoyed monthly luncheons with other office personnel from Las Cruces Public Schools. Most of all she loved her little cabin in the mountains and the friends she made there. 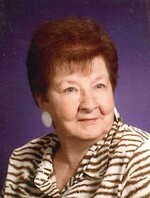 She was a member of Mountain Garden Club for 15 years. Her journey with cancer began in 1965 and continued until her death. She is survived by two daughters, Sharon Bond husband Marlin of Las Cruces, NM, Tana Hiltz fiancé Severo Alcoset of El Paso, TX and one grandson Shawn Hiltz wife Sylvia of Carrizo Springs, Texas. She also leaves behind one brother Robert Dean Skelly of Lima, Ohio. She is preceded in death by husband Robert Louis Mummaw, parents Robert and Louise Skelly, sisters Roberta Johnson of California, Shirley Azevedo of Napa, California, and Jeanette Ridenour, Lima, Ohio; brothers Neil Skelly and Carl Skelly of Lima, Ohio, and Ralph Skelly of Phoenix, Arizona. A small Memorial Service will be held at First Presbyterian Church on Saturday, February 9, 2019 at 1:00 pm with the Rev. Norm Story officiating. Her ashes will be interred in the Columbarium. The family asks that memorials in Elinor’s name be made to M.D. Anderson Cancer Center, PO Box 4464 Houston, TX 77210-4464 or Safe Haven Animal Sanctuary, 840-D El Paseo Rd. Las Cruces, NM 88001. To send flowers to the family of Elinor Margaret Mummaw (Skelly), please visit our Heartfelt Sympathies Store.